NASA's Deep Impact probe flew by the second comet of its mission Thursday, successfully navigating near an unusually active ball of ice and rock more than 13 million miles from Earth. 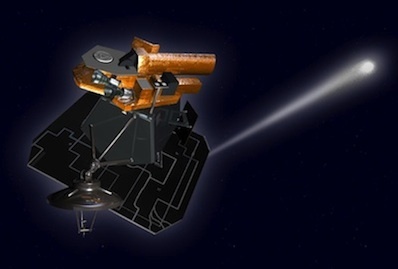 The car-sized spacecraft, left over from a dramatic 2005 impact mission, was aiming for a target point about 700 kilometers, or 435 miles, from comet Hartley 2. The closest approach occurred at about 1401 GMT (10:01 a.m. EDT). The probe hit its aimpoint and navigation was spot-on, according to controllers at the Jet Propulsion Laboratory in Pasadena, Calif. Controllers stayed in contact with the craft during the flyby, proving it survived the risky flight through a cloud of icy debris surrounding its rocky core. Flying past the comet at a relative speed of more than 27,500 mph, the Deep Impact spacecraft was in autopilot mode to enable the probe to quickly pivot and keep the comet nucleus in view of two scientific cameras. One of the imagers planned to collect pictures of the comet's nucleus and coma, while the other instrument will scan the comet in both visible and near-infrared light, yielding data on the core's composition and texture. The cameras were programmed to snap images about once every four seconds, according to mission officials. Scientists will wait about a half-hour before receiving the first pictures from the flyby. The Deep Impact spacecraft was transmitting low-rate communications to Earth during the closest approach, but controllers planned to switch to the craft's high-gain antenna a few minutes later. The flyby is the fifth time a comet has been imaged by a nearby spacecraft, but researchers believe Hartley 2 is the smallest and most active comet ever visited. "Every time we go to one, they are full of surprises," said Michael A'Hearn, the principal investigator of the EPOXI mission. A'Hearn, a scientist from the University of Maryland at College Park, said the goal of Thursday's flyby was to separate the features of Hartley 2 that are left over from its ancient formation and those that are a result of its evolution. "We picked this comet largely because we wanted to go to one that was very different from the ones we had gone to previously," A'Hearn said. During the weeks leading up to Thursday's approach, the Deep Impact spacecraft snapped photos of powerful jets erupting from the comet's surface. "I hope we will get pictures of the jets and see where they're coming from. That's what we all want," A'Hearn said. The EPOXI mission is an extension of the Deep Impact project, which dropped an impactor on comet Tempel 1 in July 2005. With its mission complete and the flyby spacecraft still healthy, NASA selected a four-year $42 million extension to search for extrasolar planets and fly by Hartley 2.